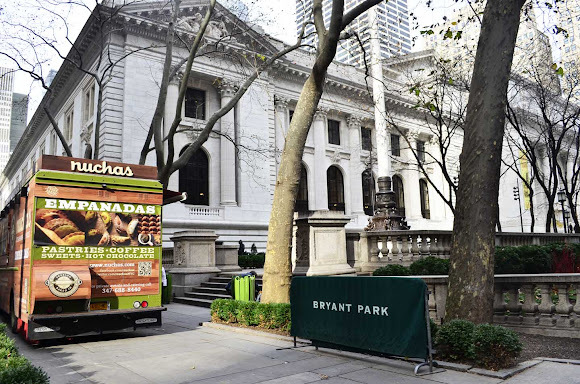 As part of the Lunch Hour NYC exhibit going on inside the New York Public Library, we brought an exciting collection of Food Trucks to the terrace outside the Stephen A. Schwarzman this summer and fall. After a successful first round, we've continued the rotating schedule of lunch choices into the winter season with a few new options. Food Trucks on Fifth features an exciting variety of cuisines and flavors to help you switch up the normal lunch routine malaise. Check out the full schedule here, click through to browse their full menus, and plan your next lunch outing. Trucks are open weekdays 11am to 3pm. Too cold to sit outside? All of the trucks prepare food to go, so you can easily take it back with you to the office. And don't forget, Lunch Hour NYC is free and open to the public inside the library through February 17, 2013. The exhibit explores the history of the midday meal and its quintessential New York elements - power lunches, automats, eating destinations and more.